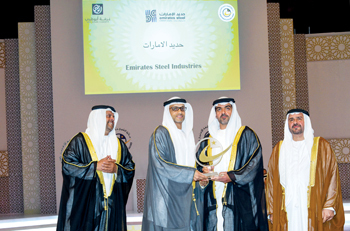 TOP UAE steelmaker Emirates Steel has received the gold category of the Sheikh Khalifa Excellence Award (SKEA 2014). The prize was presented to winners by Sheikh Hamed bin Zayed Al Nahyan, chief of the Abu Dhabi Crown Prince’s court, at a ceremony held at the Emirates Palace. Commenting, CEO Saeed G Al Romaithi said: “We are honoured to receive this prestigious award, which acknowledges our dedication and efforts in focusing on our customers and providing them with world-class steel products”. Winning the gold prize demonstrates the Abu Dhabi-based steelmaker’s continuous improvements in its manufacturing process and the significant changes the $3 billion company has brought to all of its product range delivery, an Emirates Steel press statement said. Two years ago, Emirates Steel – a Senaat company- had won the silver version of the award. “Winning gold this year gives enough proof of our continuous improvement and effective deployment of the business excellence model in our everyday steelmaking business. This is why we are strongly committed to attaining and sustaining excellence at all stages of our business operations and processes,” Al Romaithi said. Al Romaithi expressed thanks to UAE President Sheikh Khalifa bin Zayed Al Nahyan and the Crown Prince of Abu Dhabi and Deputy Supreme Commander of the UAE Armed Forces, General Sheikh Mohammed bin Zayed Al Nahyan, for their support to Emirates Steel. Emirates Steel is owned by Senaat, the UAE’s largest industrial conglomerate and a driving force for implementing the Abu Dhabi government’s industrial diversification policy. Strategically located in the Industrial City of Abu Dhabi, some 35 km away from the heart of Abu Dhabi City, it is the only integrated steel plant in the UAE, utilising the latest rolling mill technology to produce rebar, wire rod and heavy sections. 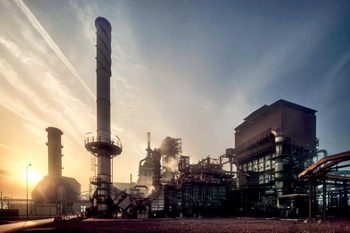 Established in 1998, Emirates Steel grew in a relatively short period of time from a simple re-roller of imported steel billets to a complex integrated manufacturing plant, using modern solutions to tackle traditional industrial problems and generate value for its various stakeholders. In 2012, the company began producing at a capacity of 3.5 million tonnes per year, following two expansions and investment of around $3 billion.